The MM2X (Multi-Material Dual Extruder) is a replacement dual extruder system for the Makerbot Replicator 2X that guarantees reliable printing with PLA, ABS and other materials. The clever gang at RoboSavvy have experience and expertise in support and printing with Makerbot printers and therefore took it upon theirselves to improve the nozzle system making multi-material printing with the Replicator 2X a reality. The MM2X kit can be easily installed in less than 30 minutes1 and is compatible with MakerBot MakerWare default profiles. The MM2X design uses a PEEK insulator instead of metal parts between the aluminum bar mount and the nozzle which in turn prevents the heat transfer that causes issues with PLA printing. We also added an internal teflon guide to ensure smooth movement of the filament. 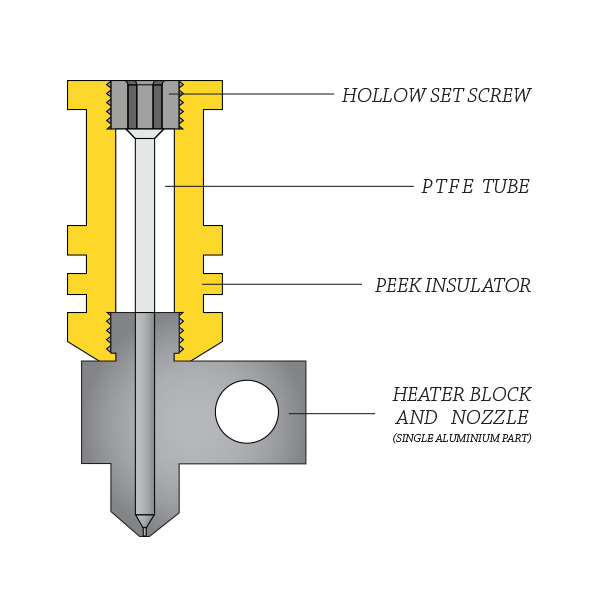 This design solves the issues due to the heat generated in the nozzle which is transferred up to the aluminium bar mount through the original metal guide tube causing the PLA to melt before it reaches the heater block. This effect is most pronounced when performing "retractions" (suction of filament between extrusions) preventing the filament from properly flowing inside the nozzle. 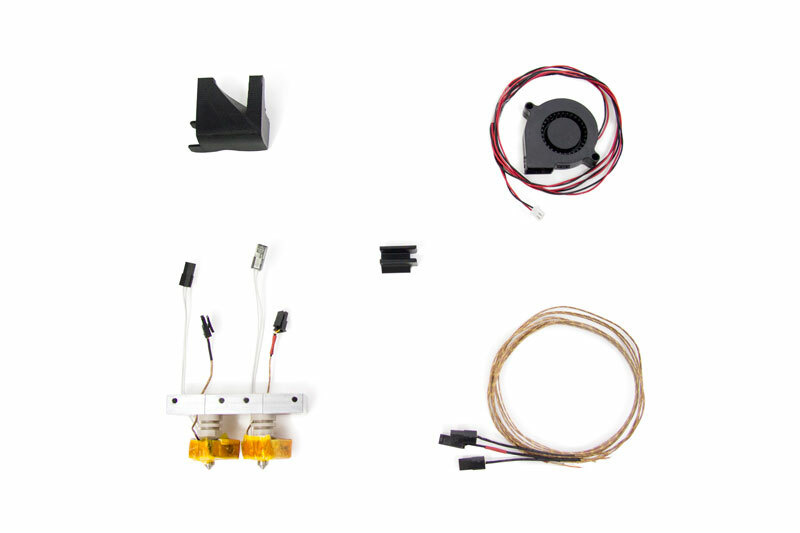 The MM2X kit also includes a radial fan and duct to cool the filament immediately after extrusion. This greatly improves the surface quality of PLA prints. Can it print in PLA and ABS in the same print? NOT for the faint of heart but we have had some success in printing PLA and ABS in a single print. If you decide to give it a try, make sure the Fan airflow is directed only at the PLA nozzle. You can simply block the airflow in the provided 3D printed duct or we can provide the CAD model of the fan duct so you can remodel it for this purpose. If you do give this a try, we?d love to know how it turned out! Do I have to change any of my Makerware settings? You shouldn?t have to. The pre-set profiles for ABS and PLA on Makerware should render you good prints for your Replicator 2X. We have found however, that for PLA we have achieved better results by lowering the default extruder temperature a bit from 230? to 215?C. Will there be a loss of Z height build volume when installing the MM2X ? When using Makerware, the fan starts only after it completes the first layer. Wait until the printer has started the second layer for the fan to start. The nozzles are not the same height! Our manufacturing process guarantees that the nozzles are the same height and once they are installed into the aluminum bar, the maximum height difference between the left and right nozzle tips is within less than 0.01mm. However, the Rep2X plastic carriage may have some accumulated stress and heat distortion that may cause the nozzle tips to have a small height difference with respect to the build platform. This is easily fixed. In the kit we have included small shims (spacers) that can be inserted underneath the left or right side of the aluminum bar mount to compensate for any height difference between the left and right nozzles. Please check our Installation Instructions to see how to insert the spacers. 1 If needed, the stock extruder nozzles can be easily reinstalled. If these nozzles become blocked, they can be replaced within five minutes as opposed to original nozzles, which can take over 30 minutes. Not always in stock in Canada - may require 2-3 weeks for delivery?